Debrecen is the second most populated city in the country. It is called "Calvinist Rome" because of the central role it played in the Hungarian Reformation in the 16th century. Debrecen has been a university town since the Middle Ages. It was one of the "capitals" of the Revolution and Independence War in 1848-49. 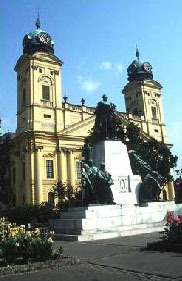 The symbol of the city, the Great Church of Debrecen, with 3000 seats, is the largest Calvinist church in the country. Its interior decoration is in the severe puritan style. One treasured relic is the armchair of Lajos Kossuth who on 14th April 1849 proclaimed the dethronement of the Habsburg House here. The Calvinist College with its famous students, became the "School of the Country". The 180 year-old building contains a fully equipped original Calvinist school, old masterpieces of goldsmith work, wonderful embroideries and painted furniture. The Great Library is a national monument. The rarest books in the 50000 volume collection are the 39 codices. The Hotel Aranybika is the oldest working hotel in the country. The following are also worth seeing: the Small Calvinist Church with its truncated tower, the Red Church, the Synagogue, the Greek Orthodox Church, the Lajos Kossuth University of Sciences, the D�ri Museum and the Basilica of St. Anne. The Great Forest [Nagyerd.] park has been a nature reserve since 1939. It includes a zoo, an amusement park and a botanical garden. The thermal water of the Nagyerd. Medicinal Bath is used for treatment of many ailments. 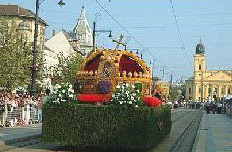 The festivals and cultural programs have earned international fame for the city.